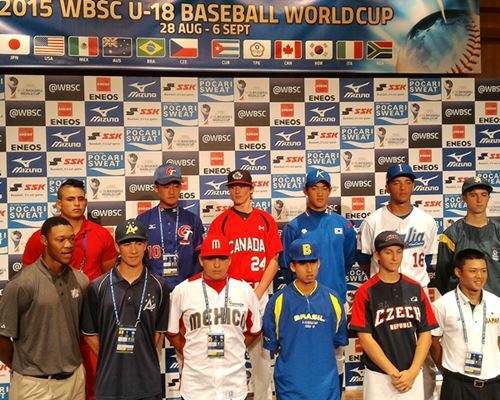 OSAKA, Japan – The 2015 WBSC U-18 Baseball World Cup is set to open Friday, with all twelve nations in action. The event in Osaka represents the twenty-seventh time that the U-18 world championship has been contested, uniting the world’s top young talent on one stage, since its launch in 1981. The 2015 U-18 Baseball World Cup features six out of the Top 10 nations in the world, and eleven out of the Top 20, setting the stage for the most competitive U-18 Baseball World Cup on record. The WBSC U-18 Baseball World Cup, along with its continental qualifiers, have featured some of the biggest names in the sport, such as Canada's Brett Lawrie, Japan's Yu Darvish, South Korea's Shin-soo Choo, Cuba's Yasiel Puig and Aroldis Chapman, and USA's Clayton Kershaw, Bryce Harper, Manny Machado, Buster Posey, among countless others. The most recent generation of rising stars include Cuba's Yoan Moncada, Jorge Soler, USA's Francisco Lindor, Canada's Dalton Pompey and Japan's Shohei Ohtani and Shintaro Fujinami. The last time Mexico and Australia met in U-18 Baseball World Cup competition was in 2008 in Canada both teams also met on the first day of the tournament. Australia won that game, 11-7. Since 2006, only once have Mexico conceded more than 11 runs in a game at the U-18 Baseball World Cup, when Chinese Taipei scored 17 runs against Mexico in 2013. Reigning champions United States will meet Czech Republic for the first time in recent years. Since the first edition in 1981, United States have won the tournament seven times, only Cuba have won the world title more times (11). Czech Republic have lost all their 20 group stage games in their last four appearances, while United States have lost only two of their last 23. Japan and Brazil have not met in the last five editions at the U-18 World Cup. Japan were the finalist in last edition in which they lost against United States (3-2; both teams had six hits and one field error). Cuba have won both games these teams played at the U-18 World Cup since 2006. In both games, Italy were shut out (4-0 and 15-0). In 2013, this game ended after only six innings. Cuba scored 15 runs and had 15 hits without making a field error. Italy had hit three times but did not made it to the plate (1 error). The last time South Korea and South Africa met at the U-18 World Cup was in 2006. South Africa lost 9-0 against Korea in that game. South Africa lost all their group stage games. For South Korea, it was their only shutout in the group stage in 2006. Since 2006, Chinese Taipei and Canada have met six times at the U-18 World Cup, with Taipei winning four and Canada two. Chinese Taipei have won their last four games against Canada at the U-18 World Cup, including the game in 2013. The last victory for Canada over Chinese Taipei came at the 2008 U-18 World Cup, when Canada was the host and Brett Lawrie went 3 for 4 (all triples) to help Canada prevail, 7-6.